As one of the most respected swimming pool service companies in the Goodyear, Arizona area, we’re constantly helping homeowners understand the role chemicals play in swimming pool maintenance. When there are leaves in your pool, you skim them out. When there’s a gash in your pool lining, you call Universal for swimming pool repair. But it’s much harder to “see” when the chemical balance of your pool is off. Unfortunately, just a slight deviation in the balance of pool chemicals can be the difference between a fun experience and a hazardous one. In this post, we’ll take a look at common chemical treatments for pools, as well as the role chemicals play in swimming pool upkeep. Pool chemicals are confusing, expensive, and make pool water irritating to our skin and eyes. So why do we insist on using them for swimming pool service? The truth is that without chemical treatments, pool water can become unsafe and unsavory looking. 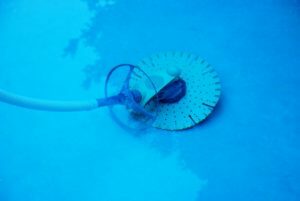 “Without treatment, pool water can become contaminated with algae, bacteria, and dangerous microorganisms,” explains Poolpricer.com. And it’s safe to say that contaminated water isn’t going to match the dream of a sparkling blue pool you’ve got in your head. So you’ve got to use chemicals, but which ones? Chlorine – This is the chemical with which most people are familiar when it comes to swimming pool service. Added to the pool in liquid, tablet, or granular form, chlorine kills most of the nasty stuff that would otherwise be swirling around in your pool. Stabilizers – While most people know that chlorine needs to be added during swimming pool service, very few realize that chlorine would be totally ineffective without stabilizers. “On its own, chlorine is rapidly destroyed by the sun’s rays. Stabilizers are chemicals that combine with chlorine to form a more durable compound, boosting its performance,” continues Poolpricer.com. Unsure what sort of stabilizers you should use in your pool? Contact Universal Pool Service for help! Shock Treatment – So what happens if you forget to add stabilizers, and the chlorine in your pool completely disappears? A pool without chlorine needs to be “shocked” back into shape with a high dose of chlorine. This has to be handled very carefully, however, and requires living beings to stay out of the pool for a while. pH Level – We won’t bore you with the complicated details of acidity and alkalinity. Instead, suffice to say that if your pool’s leaning too far one way or the other, it can damage your pool equipment and make it impossible for the gunk-killing chlorine to do its job properly. Professional Swimming Pool Service Keeps Things Simple! While all of this can seem very confusing to the novice pool owner, we don’t want you to feel anxious or stressed. After all, a pool is for relaxing and making memories with friends! Why not leave the swimming pool chemical service up to the experts at Universal and worry about working on your tan instead?